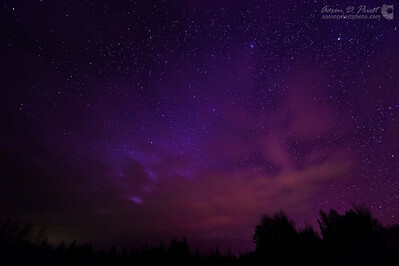 We had a beautiful crown of northern lights for a short while tonight over much of New England! This panorama was taken from my front yard in Lee, Maine, September 1, 2016, 22:33. The flare is most likely an Iridium satellite. 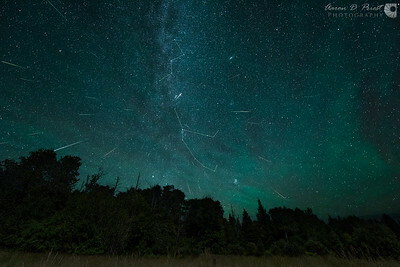 The much dimmer streak is a legitimate meteor. Andromeda is to the right of our own Milky Way galaxy at the edge of the frame. 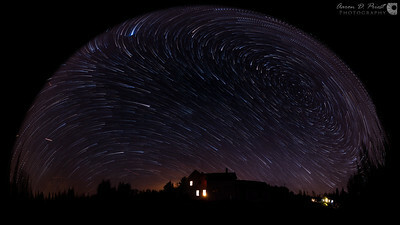 Camera settings: 14mm, f/2.8, ISO 6400, 20 seconds, 3 stitched photos. Equipment used: Nikon D810, Nikon 14-24mm f/2.8, Really Right Stuff TVC-34L tripod & BH-55 ballhead. Long exposure noise reduction via Pixel Fixer, RAW conversion via Lightroom, aligned via PTGui, and manually blended via masks in Photoshop. November 4, 2015, 6:13 PM I took a friend, Ty Oliver, out for his first attempt at shooting the Milky Way in my town. This is one of the shots we captured. We had a narrow window of 14 minutes to capture the galactic center of the Milky Way before it dropped below the horizon after astronomic dusk. In four more nights you won’t be able to shoot it at all in this area until the end of January just before astronomic dawn, due to the tilt of the Earth during winter. Too bad the clouds never cleared enough for us to really capture it. The lights on the clouds must be from Burlington and Lowell, as Enfield would be a bit to the right and Lincoln far right and out of frame behind the trees from this direction. You can see three of the windmills between Lincoln and Burlington reflecting in Silver Lake (also known as Mattakeunk Pond). The bright star in the top right is Vega, the second brightest star in the northern hemisphere. 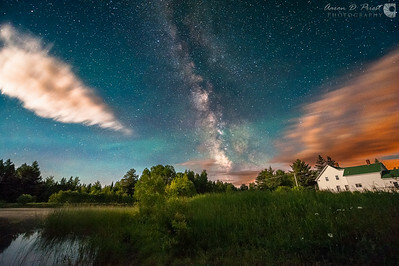 Nikon D810, Nikon 14-24mm f/2.8, Promote Control, Really Right Stuff TVC-34L, leveling base, & pano/gimbal head @ 3071°K, 14mm, f/2.8, ISO 6400, 25 seconds for the sky blended with ISO 1600, 400 seconds for the ground. Noise reduction via dark frames with Pixel Fixer, edited with Lightroom, exposures manually blended with Photoshop. This is a stack of 364 photos from a timelapse I shot on August 13, 2015 in my back yard, from 12:51 AM to 3:22 AM. It took a few days to manually remove every satellite, airplane, and meteor from the photos before stacking. 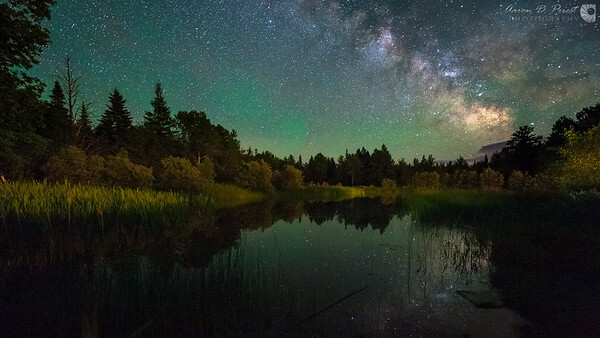 The green color in the sky is caused by air glow. The bright star streaking from the treetops is Capella. The cluster of stars to the right of that is Pleiades. 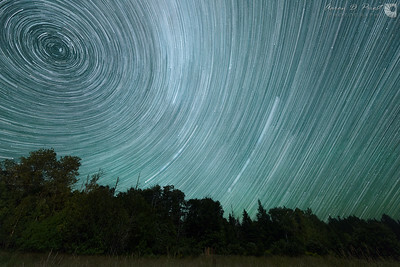 Everything is spinning around Polaris or the North Star, the bright star with the shortest trail in the top left (from our perspective anyway—it is actually Earth that is rotating). Taken with a Nikon D810, Nikon 14-24mm f/2.8, DewNot heat strip, DewBuster Controller, Really Right Stuff TVC-34L tripod & BH-55 ballhead, and qDslrDashboard running on a Nexus 7 (2013 model). 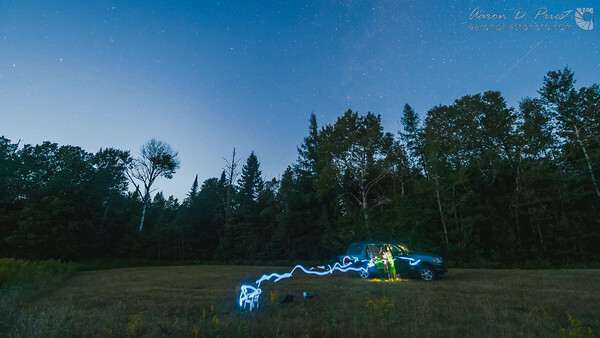 These shots were taken at 14mm, f/2.8, 20 seconds, ISO 5000, and 3550°K. Edited with Lightroom / LRTimelapse and stacked with Advanced Stacker Plus in Photoshop as 16-bit TIFFs. This is a timelapse I took of the Perseid meteor shower, sunrise, and afternoon clouds in my back yard the morning of August 13, 2015. I missed most of the night because I had to wait until 12:50 AM for the sky to clear after thunderstorms, and dawn was less than three hours later. We did have some amazing green air glow though! 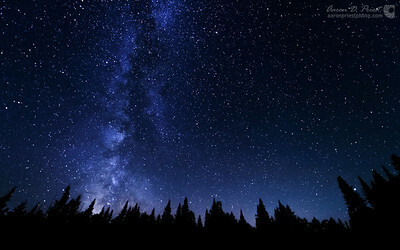 The Andromeda galaxy can be seen to the right of the Milky Way as Pleiades and Capella can be seen rising from the tree tops, facing roughly 58° north east on the compass dial. I took 1,937 photos for almost thirteen and a half hours until 2:17 PM when the battery in my Nexus 7 tablet running qDslrDashboard died. I had a dew heater on the lens through the night and sunrise, set to 5° above ambient temperature, but even that wasn’t enough to completely prevent dew on the lens at sunrise. I should have dialed it up more. Taken with a Nikon D810, Nikon 14-24mm f/2.8, DewNot heat strip, DewBuster Controller, Really Right Stuff TVC-34L tripod & BH-55 ballhead, and qDslrDashboard running on a Nexus 7 (2013 model) for shutter, ISO, and aperture ramping. The night exposures were 14mm, f/2.8, ISO 5000, 20 seconds ramped to f/13, ISO 64, 1/2500 for some of the day shots. Edited with Lightroom / LRTimelapse and rendered in 7.3K ProRes 442HQ with Premiere Pro from 16-bit TIFFs. Music is a segment of Getting Closer from Hunting the Light by Peter Nanasi. Used with permission. 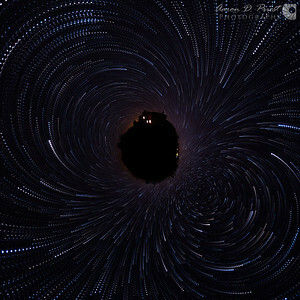 Visit his website and purchase his music here: http://www.peternanasi.com The whole album is great! This is a stack of Perseid meteors from a timelapse I shot on August 13, 2015. I chose my 50 favorite meteors from 12:52 AM to 04:08 AM, rotated and aligned the frames so the stars are all in a fixed position, and masked in the meteors so you could see them radiating from Perseus. 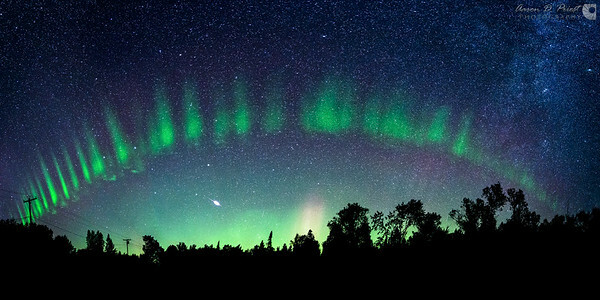 The green color in the sky is caused by air glow. The Andromeda galaxy can be seen to the right of our Milky Way as Pleiades and Capella rise from the tree tops, facing roughly 58° north east on the compass dial. The Double Cluster is just to the left of a bright meteor near the middle of the photo. 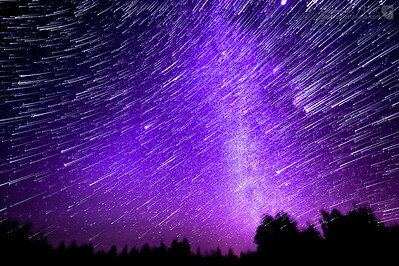 Polaris or the North Star is opposite Andromeda on the other side of our Milky Way. Taken with a Nikon D810, Nikon 14-24mm f/2.8, DewNot heat strip, DewBuster Controller, Really Right Stuff TVC-34L tripod & BH-55 ballhead, and qDslrDashboard running on a Nexus 7 (2013 model) for shutter, ISO, and aperture ramping. These shots were taken at 14mm, f/2.8, 20 seconds, and ISO 5000 to ISO 800 during astronomic dawn. Edited with Lightroom / LRTimelapse, aligned with RegiStar, and stacked with Photoshop as 16-bit TIFFs. This is a stack of Perseid meteors from a timelapse I shot on August 13, 2015. I chose my 50 favorite meteors from 12:52 AM to 04:08 AM, rotated and aligned the frames so the stars are all in a fixed position, and masked in the meteors so you could see them radiating from Perseus. I added constellation lines for Cassiopeia and Perseus in this version. 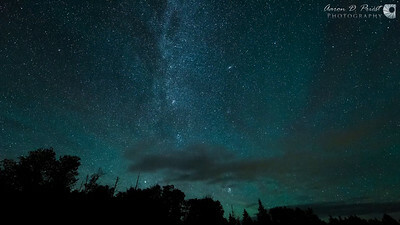 The green color in the sky is caused by air glow. The Andromeda galaxy can be seen to the right of our Milky Way as Pleiades and Capella rise from the tree tops, facing roughly 58° north east on the compass dial. The Double Cluster is just to the left of a bright meteor near the middle of the photo. 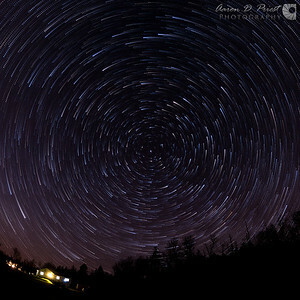 Polaris or the North Star is opposite Andromeda on the other side of our Milky Way. Taken with a Nikon D810, Nikon 14-24mm f/2.8, DewNot heat strip, DewBuster Controller, Really Right Stuff TVC-34L tripod & BH-55 ballhead, and qDslrDashboard running on a Nexus 7 (2013 model) for shutter, ISO, and aperture ramping. These shots were taken at 14mm, f/2.8, 20 seconds, and ISO 5000 to ISO 800 during astronomic dawn. Edited with Lightroom / LRTimelapse, aligned with RegiStar, and stacked with Photoshop as 16-bit TIFFs. 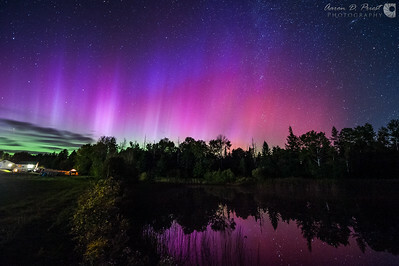 September 12, 2014, 8:46 PM Last night we were treated with quite a short, but intense, display of northern lights across much of the northeastern United States. It was visible soon after sunset and peaked around 8:45 PM. By 9 PM it had mostly faded from view, but I continued to get some very faint color for another hour until the moonrise washed it out. This is my favorite frame of a timelapse I captured of the solar storm reflecting in the pond in my back yard. The Andromeda galaxy can be seen in the upper right. Camera settings: 14mm, f/2.8, ISO 2500, 20 seconds, 3360°K white balance. Equipment used: Nikon D700, Nikon 14-24mm f/2.8, RamperPro, eMotimo TB3 Black, Dynamic Perception Stage Zero dolly, Really Right Stuff TVC-34L tripod, BH-40 ballhead, and clamps, MeFOTO RoadTrip tripod, DewNot heat strip, DewBuster, and Goal Zero Sherpa 100 battery. This is a single frame of a timelapse taken shortly after the moonrise (left of frame) had cleared the trees behind my pond and lit my house. There was a lot of beautiful sky glow that night (the green and purple hues). This is the same RAW file exported twice out of Lightroom with two different exposures for the ground and sky, and then manually blended in Photoshop with a mask. 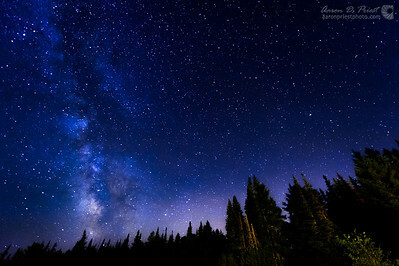 Shot with a Nikon D700, Nikon 14-24mm f/2.8, and RamperPro @ 14mm, f/2.8, ISO 3200, and 30 seconds. 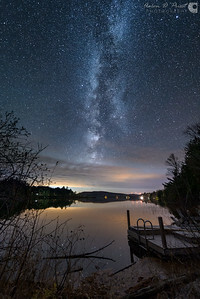 Milky Way reflecting over my backyard pond in Lee, Maine on June 19, 2014, 11:11 PM. I went out to shoot a timelapse of sunset, the Milky Way reflecting in my pond, and moonrise last night. I ran into a lot of battery and cable issues and didn’t get the full timelapse I wanted, but I still salvaged a few good frames. This was taken a little after astronomical twilight (23:02) and before moonrise (47% at 00:07) when the sky was at its darkest. There was a lot of beautiful air glow last night, and a crazy amount of dew. The light on the grass and trees is from my kitchen window. Shot with a Nikon D700, 14-24mm f/2.8, Ramper Pro, & DewBuster dew heater controller w/ Dew-Not heater strip @ 14mm, f/2.8, ISO 3200, 30 seconds. Edited with Lightroom. August 29, 2014 My kids love camping in the back yard. 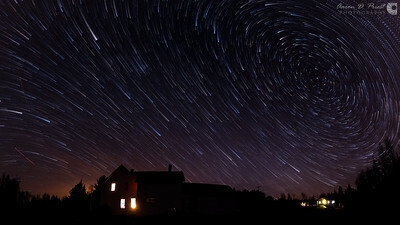 I set up my camera to point north for some circular star trails, and maybe a chance of aurora overnight. It was a very clear night. 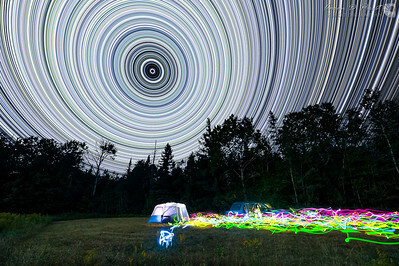 In the beginning of the timelapse you can see the kids running around with their glow sticks as we setup the tent. Andromeda is visible next to the northern end of the Milky Way. 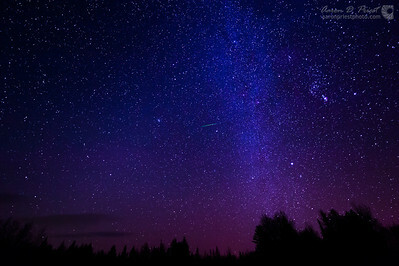 Cassiopeia is in the middle of the Milky Way. The kids have a toy that projects stars on the ceiling and walls that we wanted to try out in the tent when they went to bed. It slowly rotates through a few different colors. Sped up in the timelapse video it looks more like disco lights though! The rest of the lights in the tent are from the kids’ glow sticks. 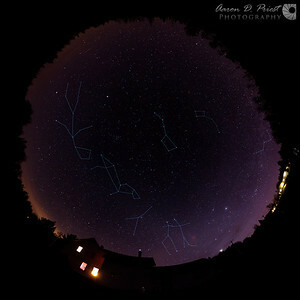 Pleiades shows up briefly on the right side in the middle of the timelapse, but goes out of frame after a few seconds. The bright star that rises out of the trees afterwards is Capella. 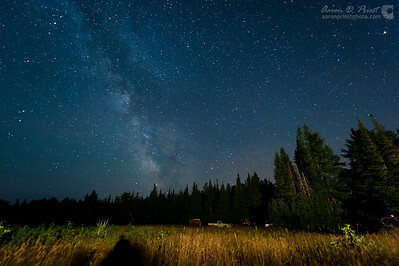 There was a little bit of green airglow in the early morning hours, but no real aurora. I didn't setup anything too fancy for this timelapse, no bulb ramping or anything too complicated. Just single 30 second exposures every 3 seconds until dawn with a Promote Control, Nikon D700, and Nikon 14-24mm f/2.8 @ 14mm, f/2.8, and ISO 2500. White balance was gradually changed with LRTimelapse during post-processing. I used a Dew-Not heat strip with a DewBuster controller overnight to prevent dew, and powered the dew heater and camera from a 12v battery.